Sofia Helin is the star of the Nordic drama/thriller `The Bridge'. The two series have been a dramatic hit on TV's BBC4 and a third one is planned. It is one of the several Foreign subtitled dramas shown in recent years on BBC4, including Wallander, Inspector Montalbano, The Killing, Borgen and two rather dark French series Spiral and Branque. Not sure if I've got the last named correct. I've enjoyed them all and they make a welcome change from the way special effects, especially in films, have overwhelmed dialogue and storylines in many English speaking productions. The amazing thing is that she looks completely different from her damaged character Saga Noren; which illustrates what a brilliant actress she is. I was inspired to do this from a cover photo on the Guardian Weekend magazine for which thanks. I first made a careful drawing - as careful as I'm able - using my favourite Pentel mechanical pencil 07 2B. I began by painting the eyes followed by the nose and mouth. Colours were Cadmium Red Pale (Rowney), Cadmium Yellow Pale (Lukas I think) with a very little Cerulean. Her complexion is extremely light and the photograph doesn't lend itself to pronounced shading. Another problem was the hair, which is almost white-blond in places. I was taken by the overall colours, particularly the red cap but her eyes - to me - are the key feature so I concentrated on those. Colours for the hair were Raw Sienna, Raw Umber and Quinacridone Gold (Daniel Smith PO49). There is a little Burnt Umber in places. The hat is Quinacridone Coral (Daniel Smith PR209) a fabulous colour.The blue in her top is Ultramarine. Brushes were all Isabey, travel brushes 4 & 6 and Kolinsky sables 4, 6, and 8. I'm quite pleased with this one. The likeness, while not perfect, is pretty close. This was the subject at Thursday's AVA session. Attendance was on the light side with only thirteen present, possibly due to grandparenting duties as it was half-term.. Below are a number of the members shown at work. I wasn't too happy with this. I actually played around with an ipad app called Waterlogue. This converts photographs into watercolour images. There are about ten variations. I showed this to both Pat and Pauline who were both impressed with the possibilities. Yvonne's first impression was negative in that she thought it was copying a painting, which is prohibited. Actually it isn't as these are computer generated images and not paintings. You can then paint the subject and having seen the generated images it perhaps suggests ways of tackling the subject. I think the possibilities are there but it needs much experimentation and is no panacea. The resulting painting is overworked and I don't think the Centenaire paper helped, especially as it was on the back - technically the wrong side - of a reject painting. The paintings put up at the end of the session. A colourful selection. Latest Paintings - Three Different Subjects. I mentioned in the Jaguar piece that I'd also drawn a Snow Leopard but then made a mess of the painting, so scrapped it at an early stage. My usual reaction to disaster is to go straight back in so the following day I started again. Stage 1 completed I painted the rest the following day. I was moderately pleased after finishing this, although I think the Jaguar painting is superior. I keep looking at it and think it is missing something. I suspect I know what it is and to do with the background. I used several colours and my usual brushes. My next painting is another Amerindian, in this case a Chippewa warrior circa 1869. His Indian name is a lengthy and complicated one but apparently a loose translation is `Evening Sun'. What attracted me to it oddly enough was the large fur cap he wore and even shaggier fur coat. Amidst all this his face is quite small. Normally I concentrate on the face and fill most of the paper with it. While I'm again quite pleased with this painting one error is that I've made the feather too large relative to the remainder. You can see this quite clearly in the guide photograph. I used Translucent Brown (Schminke Pbr41) with a little Raw Sienna as the skin colour darkened with either Cerulean or Cobalt Blue. Three brushes were involved, the Rosemary Kolinsky travel brushes sizes 6 and 10, and the Isabey travel brush size 6. The Isabey, while long is much smaller in diameter than the Rosemary 6. It is good for the detail, especially the eyes. About 2 hours max. This was my submission for the AVA subject `Interiors' last Thursday. It is on the back of a discarded painting as is the Amerindian. Once again I forgot my camera so cannot cover my fellow artists work. Colours are mostly blues plus Ultramarine Violet, Quinacridone Coral, Perylene Maroon, Raw Sienna and touches of a few others. It is simple and modest but I quite like it as the subject is one I wouldn't paint by choice. Normally I'd post this in the previous AVA post but as It has created quite a lot of interest, both at the meeting and subsequently when I posted on Facebook, decided to cover it separately in slightly more detail. As setup at the session. You can see the guide photo on the left. Roughly half-way through - the danger point where things can go badly wrong. I decided to try and do something a little more adventurous in subject matter but consequently difficult. I made a careful contour drawing at home the previous day as I thought I might arrive rather later than actually occurred, due to the hearing aid appointment. Actually I also made another drawing of a snow leopard. but more on that later. Studying the drawing and photograph I started with the eye on the right hand side because I thought this would be the difference between success and failure. Get the eyes right and the first real hurdle is overcome. I proceeded to paint the area around the eye, initially with Quinacridone Gold (Daniel Smith PO49), Quinacridone Rust (Graham PO48), Raw Sienna (Pbr7) up to and including the ear. There is Ivory Black around the eye. I added the black spots, Maimeri Ivory Black, more or less as I was going along after most parts were dry. There was some wet in wet but only a little. I then painted the nose area before proceeding to the left hand side, which was mostly in shade. I did the eye first with the small yellow areas around it then proceeded to paint the shadow with various mixtures of Ultramarine and Burnt Umber plus some Ivory Black. I was careful to try and avoid a `Paynes Grey effect' - where the greys can be really dead and flat looking. I added some more blue and Burnt Umber later wet into wet. I also added similar mixes on the right hand side adjacent to the head. I added the black spots as I went along but can't remember the exact sequence. I should add I used Pebeo Drawing Gum, carefully applied in thin lines with a ruling pen, for the whiskers at the time I completed the drawing and the day after the AVA session a few touches of Galeria Acrylic White. Both the Pebeo and the Galeria need careful handling, get them on your clothes and lookout! Brushes were my Rosemary travel Kolinsky brushes sizes 6 and 10 with the Isabey size 6 for the fine work. There are elements in this painting I've never attempted before and I'm pleased with the result. I should add though that yesterday I started painting the snow leopard, made a complete mess and scrapped it. I shall attempt another today.
" the very best and most expensive watercolour brushes are made from the winter tail hairs of Mustela Sibirica, called in the art world a Kolinsky, but sometimes referred to as a Siberian Mountain Weasel - although there seem to be a lot in China, seen often in Beijing, where it is called a `Yellow Rat Weasel'. I believe `rat' is in the name because it kills rats, and traffic will sometimes stop in Beijing to let one across the street because of this propensity........brushes are also made from Martes zibellica, called a marten, and from `Kazan Blue Squirrel' (and a few other Russian squirrels) which I have not been able to identify.....The problem I want to address, to put it bluntly is that there is a lot of cheating and obfuscation going on in the brush market mostly around kolinsky brushes which, as I have said, are very expensive - running in the hundreds of dollars...."
As the weasel family is quite large, and not all confined to China and Russia, Canada and Korea for example are another source of tail hair, then it seems likely other similar species are involved but presumably expert brushmakers can determine what is genuine and what isn't. Can they? Does it matter if the species are very close? If marketed as genuine Kolinsky the answer is yes. The above but one paragraph is an extract of an e-mail published on Wetcancas from the collections manager of the mammal department of the American Museum of Natural History in New York, so I have assumed, he knows what he is talking about. Most sources say the finest hair is from the male animal and should be harvested at a particular time of the year - the Siberian Winter is normally quoted. However Wikpedia says that `most brushes have a mix of about 60/40 male-to female hair'. I could go on and on as there is a mass of information to delve into but where do you end? The final buyer, ie us artists, haven't a clue as to whether we are getting the genuine article or not. All reputable brushmakers claim that they use `the very finest' hair and so they may or indeed think that is what has been supplied. What to make of all this? My response is a great deal of scepticism since we all know that all is not what it seems and even well-known companies cannot be 100% relied upon. I'm not suggesting they deliberately mislead, but when we see what is and has happened in other spheres why should the art world be any different? Now to the brushes. I can only comment on my own limited experience but perhaps point you in the right direction when making choices. There are many brushmakers and the ones I know most about are European. I know little or nothing about those in America, Asia or elsewhere. If any readers would like to share their experiences I'd be delighted to add them to this piece. Where do we start? To my mind Winsor & Newton series 7, which are the most expensive sables of the lot. Winsor & Newton are no longer the famous British company of old, having been sold first to a Swedish Company and then most recently to a German one. They've even moved manufacture of the artists watercolours to France. Are the old traditions being maintained? The ether has been thick with innuendo and rumour about W & N for sometime, the general drift being that standards have slipped and quality is not what it was. This applies to brushes and paints. Some of this may well be misinformation spread by jealous rivals but it does make you wonder when you look at the way the company has been hawked around. Frankly the prices of series 7 are ridiculous and I wouldn't contemplate buying them when such excellent brushes are available at much lower prices. See what Rosemary says in her catalogue in the questions and answers section. The above illustration comes from the excellent website of Dakota Brushes www.dakotabrushes.com/ I cannot recommend this website highly enough for the mass of useful information. Detailed statistics on all the makes above with brushhead diameter and length given for every size so that you can easily see which - at least in volume of hair - are the best buys. Highly informative and a good source of brushes in North America. Let us first of all look at sizing. The above are all size 8 but as you can see there is considerable variation. Winsor & Newton claim their series 7 are up to two sizes larger than most other makes but in the above comparison the one that stands out is Da Vinci, while Escoda who are being heavily promoted by a number of high profile artists, is easily the smallest but comparable to Isabey. Naturally price comparisons have also to be made in association with actual size. In that respect Escoda don't fare too badly. The above are three Da Vinci series. It appears the numbering may vary in different markets. From top to bottom: SAA Kolinsky 10 (made I'm told by Raphael), Da Vinci Maestro 10 series 10, SAA Size 8, Escoda 1212 Size 10, Da Vinci Maestro 8, Luxartis 10. As you can see there is considerable variation in the actual size of the brush head. Raphael look pretty good and so does Da Vinci. Since I did this I obtained some Isabey brushes and like them a lot. They are on the small side size wise but long and slim. Raphael, who are French as are Isabey, make a wide range of `Kolinsky' sables. They have several types of round with different characteristics. The best source I know is Great Art www.greatart.co.uk, whose website gives full details of the range. My SAA brushes remain pristine as does a Raphael Series 8404 size 8 so I have yet to us them. Gilles Durand, a fine French professional artist who I met on several Charles Reid workshops said they lost their point after about six months. The brushes look good to me but prices are steep. Da Vinci, a German company but - I am told - with no connection to the American paint maker Da Vinci, are a favourite and recommendation to his students for many years from Charles Reid. They make excellent brushes. So far I've only used the Artissimo 44 Kolinsky mop Size 2. This is roughly equivalent to a 14 in the normal type. I like it a lot but recently the hair became detached from the brush head! the whole head just popped out! Fortunately I was able to put it back in again but this is not good for a brush costing £50 or so. Escoda the Catalonian company are making a stir with a high profile marketing campaign using some very well-known workshop artists. They market an increasing number of sets - usually three brushes - with the artists name on the handle. Escoda are a good company and well worth considering. Some of these artists go over the top with their claims that Escoda are `the best in the World'. Good certainly but best in the World? I doubt some of the others would concede that and neither do I, although I do think they are excellent brushes. This is only a snapshot of what is available. Pro Arte, better known for synthetics, make an expensive Kolinsky range. Both Winsor & Newton and Daler Rowney have other sables, some classed as `less expensive'. I have heard good reports of the Israeli Rekab brushes and so on. 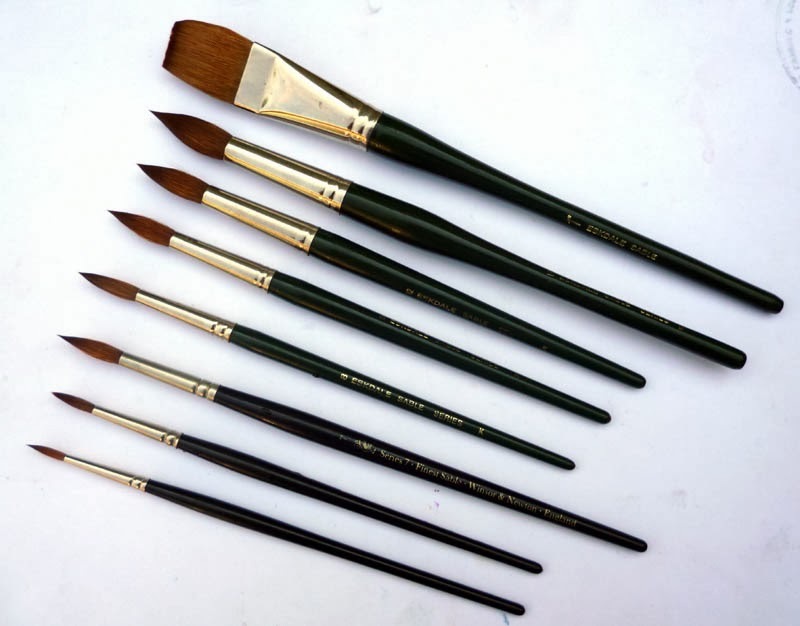 Art suppliers have their own label Sable or Kolinsky brushes and more seem to be appearing. It is bewildering and also confused by variable reports from different artists. I asked my good friends Michael Carney and John Softly on their views. Mick prefers Da Vinci and Raphael but was not impressed with the Windor & Newton series 7. He has had mixed experiences with Rosemary brushes, rather similar to me it would seem. John is cynical about `Kolinsky' and believes most if not all so-called Kolinsky brushes are not genuine. After my research so am I, although it seems there are several species of weasel that are very similar. John has 38 in total, I must be close to that figure (! ), a mixture of ABS Eskdale, Roymak, Escoda and Series 7. I don't know Roymak, but some of them date back 15 years or more and still point well. For an extensive amount of information on brushes as experienced by members try Wetcanvas, then Watercolor, then The Learning Zone and search for `Brush reviews'. This is particularly applicable to the experiences of American members. You can find out much more if you are interested by `googling' around. Now to pricing. Taking Jacksons www.jacksonsart.co.uk as a fairly reasonable guide the following prices are current, all size 8. Escoda 1212 £13.20p, Raphael 8404 £22.50p, W & N Series 7 £105, Isabey £29.25p, Jacksons Tajmir (made by Escoda) £11.00p, Jacksons Kolinsky £14.60p, Da Vinci Maestro 10 £26.50p, Da Vinci Maestro 35 £30.30p. Rosemary Series 33 £12.75p and Series 22 £29.95p. Once past size 8 prices leap into the stratosphere. The dearest Series 7 is a 10 at £151.00p! Da Vinci Maestro Series 10 go to a huge Size 50 (who would want such a thing?) at an incredible £1024.00p. Escoda make an 18 at £115.60p, Raphael; a 16 at £113.00p and Isabey a 14 at £101.20p. Rosemary makes a size 24 in series 33 at £450.00p and a series 22 in size 20 at £517.50p. Eyes watering and head spinning yet? As you can see there is quite a variation from the ridiculous £105 of W & N - how they get away with it I just don't know - to the £11.00 of Jacksons own brand. As I've highlighted earlier size is only a rough guide as brands vary since there is no recognized industry standard so this is also a factor in deciding what to buy. The final question. Do you need to buy sable brushes, whether they are called Kolinsky, red sable or just plain sable to produce good paintings. The advantages of sables are said to be much better water retention and controlled release of paint plus control over brush strokes. However despite these qualities the answer is NO and if you read what some of the fine artists I've featured use you will see this is so. The real key is the hand that controls the brush. Okay I'm a brush freak but that's just me. I think I'll end it there. Geronimo was the famous or infamous Chiricahua Apache leader who terrorized the South-West of America and large tracts of Northern Mexico during the mid to late period of the 19th century. His band were (officially) the last hostiles to surrender in 1881. Immediately following the surrender they and their families were bundled on a train and exiled to Florida. Eventually he was rehabilitated and lived out the last stages of his life as something of a celebrity. This study was painted from a photograph taken during the latter period. Some Apaches allied with Geronimo never surrendered and took refuge in the wild and largely uninhabited Sierra Madre mountains of Northern Mexico. There were reports of incidents as late as the 1920s and I suppose it is possible remnants still remain to this day. I first made a careful contour drawing ensuring everything, eyes, nose, mouth were in the right place and to scale. The two things that struck me about this photo were the hard, piercing eyes and the steel trap of a mouth, although less daunting than in his hostile days. I first painted the eyes, then the nose followed by the mouth. In order to get the skin colour fairly dark I used Translucent Brown (Scminke PBr41) as the main component instead of Cadmium Red. Cadmium Red also featured as a secondary colour with very small amounts of Raw Sienna.To darken I used Cobalt Blue Deep. (Rowney PB72). When painting the face I didn't stop at the boundaries but continued into the hair. I tried to harmonize the whole avoiding cutouts and painted mostly wet in wet. The hat colours are Ultramarine Blue, Translucent Brown and Raw Umber, again mainly wet in wet. Overall I avoided too `pretty' an approach and adopted the `be slightly crude' advice of Charles Reid. I'm happy with the result. Brushes were the usual Isabeys and the Da Vinci Artissimo 44. This is the latest subject, no actually another has just been posted the Grey Heron, for the `Paint Colorful Birds For Fun' community on Facebook. It struck me I was painting many of the birds on too large a sheet of paper so this one is smaller. As can be seen it allowed my preference for colourful subjects to flourish. After a careful contour drawing I used Pebeo Drawing Gum (masking fluid) on the head, mainly on the area above the eyes. There is also a little in the wing area, in every case just fine lines - no large areas, as well as the tree trunk. This was applied with a ruling pen, which I find very useful for this type of work. I know a number of artists urge caution about the use of masking fluid but it is very useful as long as it isn't overdone. This was the subject at Avon Valley Artists last Thursday. Another decent attendance with 17 present. Several, including me, had done some preparatory work. In my case the work involved the drawing and then careful application of masking fluid. This took some time which is why I did it prior to the session. Why masking fluid? The fruit on the cheescake had a complicated lot of highlights and the chocolates also needed some fancy work. Chocolates and Cheesecake 18" x 12" Fabriano Artistico Extra White 140lb (300gsm) Not. I apologize to the artist and viewers for the paintings above where I haven't noted the name.